Planning a envelope budget system with a fixed monthly budget can be the best solution to manage your finances, the entire month. If you uninterruptedly have trouble interrogating where all your income goes, and having the discipline to stay away from spending too much, then adopting the envelope budget system will help you get on the correct path financially and stick there. The envelope budgeting system is undoubtedly, a simple procedure of managing monthly budget. If you are completely unaware about it, then first you need to understand the basic meaning of this budget system. The envelope system has been around for years. You don’t have to save money in advance to get it started. It is an extremely tangible method where the main purpose is to store money or cash systematically to meet regular monthly expenses. You have to divide your monthly household expenses in different categories and then you keep desired sum of cash in different envelopes labeled with those categories. 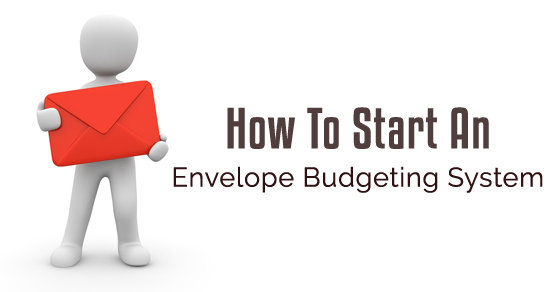 The envelope budgeting system is very simple and completely hassle-free, only if you start it the correct way. So check out how you can start managing your monthly household expenses or family budget with the envelope budgeting system. The following mentioned are few tips on how to budget your money and ways to start cash envelope system. The first step to begin with the envelope system is to calculate the total sum of money or income that you earn for spending. A better way to do is to deduct your investments and additional savings. This way, you can easily reach to the eventual sum of money available with you to meet all your expenses. In case there are some truly essential expenses to meet then either you have to reduce your investments or you need to reduce your additional savings amount. Now, once you have the overall sum of money available for spending, it is time to decide for different budget categories. The number of budget categories depends on your income in hand and your requirements. Some common categories include groceries, household items, entertainment, clothing, children education, and more. If there is any special occasion scheduled in the month then it is wise if you calculate the expense for the same while defining your budget categories. It will help you at the occurrence of the event. You have to do this by understanding your monthly requirement. In case you reside with your family and you have to keep in regards the requirements of each and every member, then you need to calculate the fiscal sum as per their requirements too. In short, the amount of money to be assigned to a specific category has to be calculated based on requirements of total number of family members. If there are other earning members in your family, then you can club the income to find out total discretionary income available in hand. After outlining different categories, it is now time to write them on, one by one, on envelopes. There is no need to go for fancy envelopes, but it is mandatory that you opt for good quality envelopes that do not easily wear off after couple of days. From rent, mortgage, to medical, don’t forget to include any of the category. You can write it on the envelope with help of a pencil. Defining each envelope with a category will simplify the entire process of envelope budgeting method. The categories are defined and the money to be spent on each one of them is decided. You can now take out cash from the ATM or from your salaried bank account to stuff your envelopes with the cash. Since each category will require a different amount of spending, so you can calculate the sum total while withdrawing the money from the account. Once the money is out, stuff it in the envelopes and get prepared to spend it wisely the entire month. You’ve decided for the categories, for the sum of money to each category on your own, so it is your sole responsibility to spend the money in an cautious way as possible. Vigilantly spend money from the envelope as and when needed, and try to save as much amount as possible. Remember you are doing this to save your hard earned money and utilize it in the best possible way. What to do if money in one of the envelopes ends up before time? Surely, this question must be hitting your mind since the time you’ve heard about the envelope budgeting system. But, this is the key to achieve success with this method of managing budget. You carefully have to spend money the entire month so that it does not get finishes. But if in case, the alternate to this happens, then you have no option but to avoid serving that category. If you keep on spending more for a category, or if you take more money from your account, then you are never going to learn the precise way of managing your expenses. Every month accompanies certain bills with it. You can pay the bills in the initial days. It is most promising way to ensure that you don’t end up increasing your debt at the end of the month. So while you plan all your regular categories, don’t forget to include your debt repayments or your credit card expenses. If you are keen saving more, then the finest way is to sidestep the credit card for further payments. What if you are able to save few bucks in your envelopes? If you are able to do so then it is simply great! You can save money left with you and reward yourself with your favorite treat at the end of the year. The type of reward depends on how much money you are able to save in the entire year. If the total saved sum is more, then think of great rewards that you can avail. While starting an envelope budgeting system is not too tough, managing it successfully is quite a pain. Most of the times, it might happen that you are either not able to save enough or you spend too much. If you really wish to come out as a winner then you have to be judicious while spending. If you think that you lack funds in a certain category then try managing the expenses between the envelopes. Try not to utilize the money that you have saved in your bank accounts for your future or for further investments. No method of managing the budget can be fruitful until and unless you are loyal to it. If you intend to make your envelope budgeting system a big success then don’t even think of taking out the money from other envelopes without prior calculation. It must not happen that you withdraw money from one envelope and then from other, and finally from the savings to fulfill your expenses. It is a simple process of segregating your income and you have to set the limit by yourself. So the probability of overspending is extremely less, and that’s how you are able to save more and spend a limited sum. Although you are saving for your medical or for retirement, and if you are able to save even more then there is nothing bad in it. The saved fund can be used to meet an emergency or as a reward for your hard work throughout the year. Employing this way makes your budget tangible, and hence you avoid using credit cards or other plastic money. In a way you are able to save more and spend less as you have limited sum of money available with you to meet all your monthly requirements. When you follow the envelope budgeting system then you won’t miss a payment. All your expenditures are upfront and you can keep a track of everything. Contrastingly, if you adopt other means of managing the budget then you might miss out making an entry. When there is no limit to spend, then most of the times, you left spending more, and that too on wasteful means. With the envelope budgeting system, you can not only control your expenditure, but also avoid spending on wasteful items as you no more have the option to withdraw more and more amount of money to meet unnecessary expenses. Unlike other budget managing systems, the envelope budgeting system is also simple and fruitful, but only if you practice it with loyalty. Besides regular monthly bills, you might also end up having some quarter or yearly expenses. So, in order to make your budget managing system a real hit, you may divide your quarterly and yearly expenditures in monthly expenses and save that sum of money against them in the envelopes. If you have little sum of money left in your envelope then it’s absolutely great! But if you have lots of money left with you at the end of the month then you must revise your budget plan , as you might have overestimated your expenses.